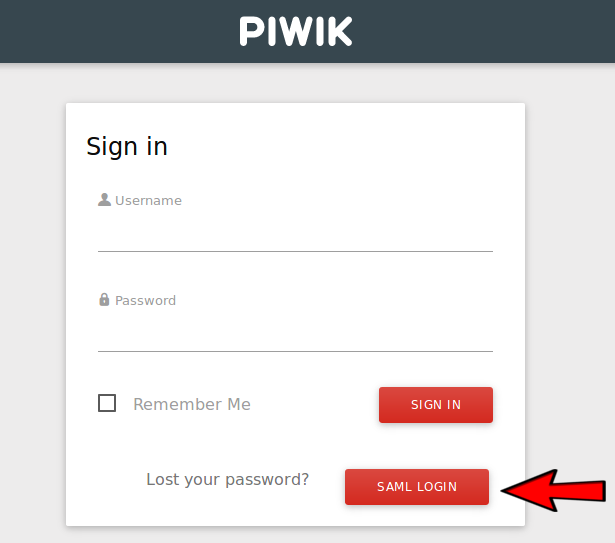 How does SAML plugin for Matomo (Piwik) work? Matomo (Piwik) SAML authentication module allows users to login to Matomo using SAML Identity Provider (IdP). If you have a federated environment with a SAML Identity Provider (OneLogin, Okta, Ping Identity, ADFS, Google, Salesforce, SharePoint…), you can use this plugin to inter-operate with it thereby enabling SSO for your Matomo Analytics (formerly Piwik Analytics) users. SAML is a premium feature which is included in our Cloud-hosted Enterprise plan or you can purchase it on the Matomo Marketplace if you self host Matomo On-Premise. Learn more about all the benefits and features of Login SAML. On the Administration > Plugins page, activate the LoginSaml plugin. Enter and save settings for SAML: add the Identity Provider info, set the attribute mappings and configure the other options as applicable. You can now open a new browser session and try to login with the SAML Identity Provider. Configuring SAML Authentication properly can be difficult so we offer our services to help you get Matomo Analytics (formerly Piwik Analytics) successfully working with SAML and enjoy the great benefits of SSO. Learn more and contact us in the SAML Support page. Now that you know the main configuration steps, let’s provide details about the SAML configuration. 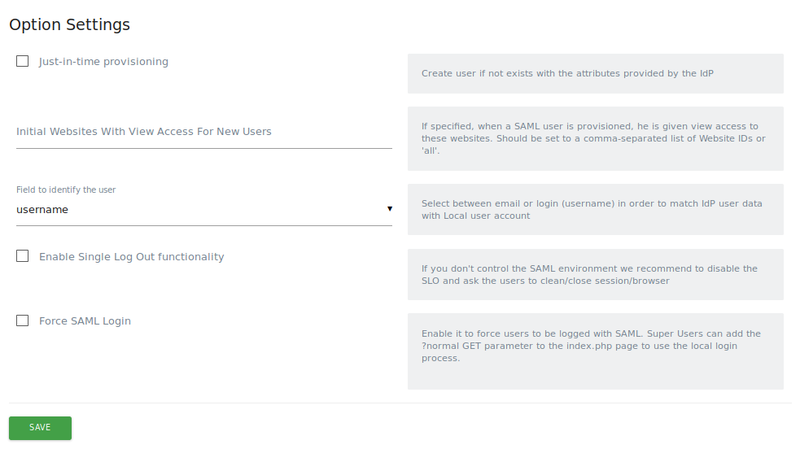 Once you activate the SAML plugin, you are able to access its settings panel. In Status Settings section you see Enable SAML authentication is disabled. When disabled, all SAML actions are disabled and if a user tries to execute them, she will receive an error notifying that the SAML functionality is disabled. You may only enable it when the rest of the SAML settings are properly configured. 2. the Service Provider SP (the service that protect the app, in this case Matomo). A circle of trust is defined between IdP and the SP, allowing all IdP users to access the SP under some conditions. That circle of trust is based on the exchange of an XML, named metadata, that describes the Entity ID, the entity endpoints and the public certificates (that will allow validation of signed/encrypted SAML messages). In the Identity Provider Settings section, you may register the Identity Provider metadata. In Option settings section you can define how Matomo (Piwik) SAML integration will act. In some scenarios it makes sense to enable the Just-in-time provisioning when you want to automatically create user accounts based on the data provided by the Identity Provider on the SAMLResponse. If just-in-time provisioning is disabled or the required user data is not provided, an error will happen during the SSO process since we will not be able to initiate any Matomo (Piwik) account. If just-in-time provisioning is enabled, by default any new users (created with just-in-time provisioning) will have no access to Matomo (Piwik). You may set a default view permission (What is the ‘view’ permission in Matomo?) to some Matomo websites. Use the Initial sites with view access for new users to set a list of the Matomo Website IDs that the users will be able to view by default (comma separated list of Website IDs). In order to identify your Matomo (Piwik) user accounts you need to set a value on the Field to identify the user, by default the email field will be used, but you can select username and the Matomo username field will be used. You may also enable or disable the single logout functionality. Note that if you disable it, the Single Logout Service data will be not published on the Service Provider metadata. Depending on the values of Field to identify the user and just-in-time provisioning, the fields of the Attribute Mapping Settings section will be either required or optional. If just-in-time is enabled, all mapping fields will be required. If just-in-time provisioning is disabled then only the field related to the value of Field to identify the user will be required. Identity Providers sends to the Service Provider the user data with custom attribute names, so you can use the previous form to map names between IdP and Matomo (Piwik). 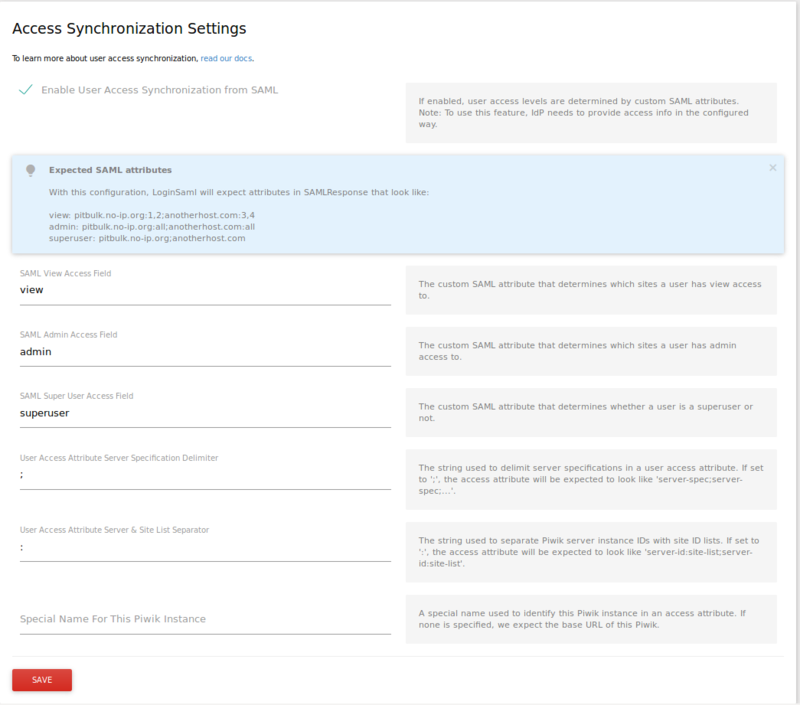 In the Access Synchronization settings section you can enable the user access synchronization from SAML attributes. Note: You can choose whatever names you want for these attributes. You will then tell LoginSaml about these names in the SAML settings page. 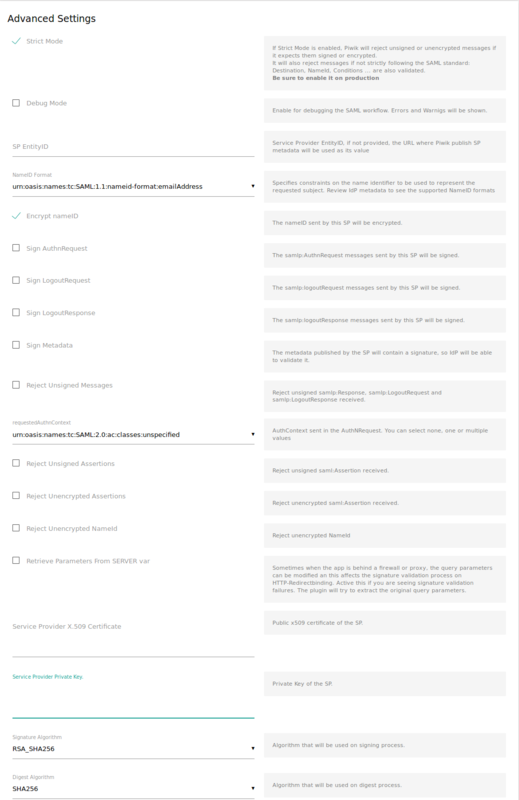 Then in the SAML settings page, check the Enable User Access Synchronization from SAML checkbox and fill out the settings that appear below it. User access synchronization occurs before the user logs in. You can customize the separators used in access attributes by setting the User Access Attribute Server Specification Delimiter and User Access Attribute Server & Site List Separator settings. In the Advanced Settings section you can enable/disable the debug mode and also configure advanced SAML and security parameters. Those settings match php-saml settings (the underlying PHP library in use in the SAML plugin and provided by OneLogin inc.), so you can review its documentation for more information. LoginSAML uses debug logging extensively so problems can be diagnosed quickly. Some logs entries contain sensitive information, so be sure to disable DEBUG logging in production and also switch off the Debug Mode in the Advanced Settings section of the SAML settings panel. The higher level, the smaller number of entries in logs. The highest level is ERROR level (the lowest is DEBUG). If no log_level parameter defined in [LoginSaml] section then the default Matomo (Piwik) log_level value will be used (WARN). How does SAML plugin for Matomo work? This plugin adds the ability to execute SAML Single Sign On (SSO) and Single Logout (SLO) on the Service Provider side, but also on the Identity Provider. This section describes the SAML authentication flows. Similar to SP-initiated SSO but without step 1. LoginSAML’s generates for new users random hashed passwords. If those users want to use the normal login process, they should assign a valid password for them once authenticated via SAML. SAML has no concept of authentication tokens, so a user’s token_auth is stored exclusively in Matomo (Piwik) database. If a token_auth is compromised, you can re-generate the token in Matomo > Administration > Personal Settings. LoginSAML uses debug logging extensively so problems can be diagnosed quickly. Some logs entries contain sensitive information, so be sure to disable DEBUG logging in production and also switch off the “debug” mode on the advanced settings section of the SAML settings panel. Learn more on the LoginSaml for Matomo Analytics (formerly Piwik Analytics) – SAML authentication plugin page.